A Very BIG thank you to all you lovely ladies for emailing me regarding guest posts.I so appreciate it and am so excited to have you hang out over the coming weeks with all of us here. To begin this series of guest posts with a bang, I have Simone from Dobermans-by-the Sea (along with Bella Luna of course!) 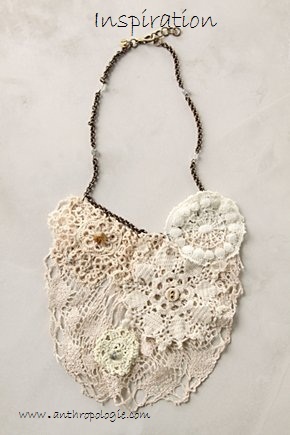 sharing an anthropologie knock off necklace. It is so pretty! So, here she is! Today I'm going to show you how to make an Anthropologie bib necklace knock off. I came across it looking for a statement necklace to dress up a plain t-shirt and jeans outfit. They used Italian lace, and I decided to give it a try since I have plenty of vintage Bavarian lace and crochet doilies and linens. Start by laying out the pattern on a table-you will want to visualize what your necklace is going to look like. Play around with different combinations until you find one you love. If you don't have small doilies you can cut circles from a larger one. Some of my buttons came from vintage pillowcases. Be creative! Then it is time to assemble the necklace. Lay the chain out straight and hang the large doily over it. Depending on the size of your doily you can adjust how it looks and you might have to cut part of the back side off. You can either glue the doily together or use little rings like I did to secure it to the chain. You will want to place on ring in the middle, one each on the outer corners and perhaps two more where you see fit. Then start gluing the buttons and pearls onto the smaller doilies according to your vision, and then glue the smaller doilies onto the bib. I put a towel in between the top bib layer and the back bib layer, to prevent glue from leaking and sticking them together. I used Fabri Tac and you will want to use only small dabs and work fast. You can rub it right off the fabric and your hands should you the need arise. Let dry for 24 hours and Et Voila! You are ready to go! I'm currently envisioning a high cut black dress with this necklace to wear to a formal event. TIP-you will want to adjust the width of your large doily to what works best for your body type. A small frame will need a smaller necklace or it will overpower, and wider shoulders can get away with a larger bib. My name is Simone and together with my dog Bella Luna we blog over at Doberman's by the Sea. I would like to thank Holly for this great opportunity. Holly has been kind to me, she was one of the first bloggers I met when I started out. We would love to have you, so don't miss out on stopping over! If you make one of those necklaces, please share with us as well. I truly appreciate you sharing this fabulous knock off with us! Now everyone go say hi to Simone and Bella Luna! Hi Holly, thanks for the feature and the compliments! Have a great day. Fun- and much better than the anthro price, I'm sure!